In her mid-century coachman’s coat and tricorne hat adorned with NZ native bird emblems, Paddy-Ann’s presence is always a unique delight. With traditional 18th century colour and fanfare, her town crier duties often include greeting guests, leading parades and officiating at ceremonies. Paddy-Ann took a break from primary school teaching when she moved with her husband, Rod, to the Teviot Valley in 2009. She’d been Gore’s part-time town crier so it was only natural she’d offer her unique `crying’ services in Central Otago. Paddy-Ann pens a special, celebratory cry for every occasion she attends. In her resplendent regalia reflecting Central Otago colours, some see her as a bit of a `flash pirate’. Living in Central Otago means making a difference, Paddy-Ann says. Everyone can contribute—setting new directions and taking on new challenges. There’s no doubt Paddy-Ann brings a rare, leading-edge quality with her crying skills, winning awards here and overseas. In 2015, she organised an international contest for the world’s best town criers in Alexandra. Paddy-Ann revels in the diversity Central Otago offers—the richness of history, place and people, and the things that happen here. 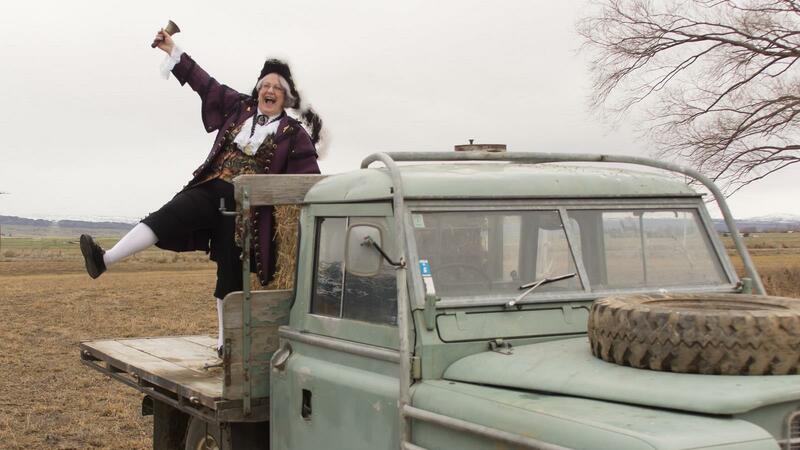 From her distinctively handcrafted town crier regalia to her carefully chosen cries, Paddy-Ann keeps history alive as she shares Central Otago’s captivating regional stories of yesterday and today.